I hated leave-in hair conditioner because of the overwhelming scented smell and the way they make my hair feel (oily to say the least), until I stumble upon these. I had really damaged hair thanks to all the coloring and perming, so I was in desperate need of something to help the split ends and dryness of my hair. Upon researching and mama Shyu’s recommendation, I decided to give the Aveda Damage Remedy Daily Hair Repair (left) a try. It is not your typical smell good girly leave-in product, instead it has a hint of a herb/grass scent that smells like nature but not overwhelming. The consistency is pretty liquid-y and can be easily brushed in with your fingers, and doesn’t leave your hair feeling oily at all. I really like this product not only because it smells effortless and natural and does not leave your hair greasy, but also because it works wonder to your hair! My hair feels so smooth when this product is applied, and there is a noticeable difference when I don’t use it. I really recommend anyone whose suffering from split ends, dry and damaged hair! When I started to dye my own hair more often, I was trying to figure out a way to preserve the color for longer since when using store bought hair dye the color usually fades within weeks. 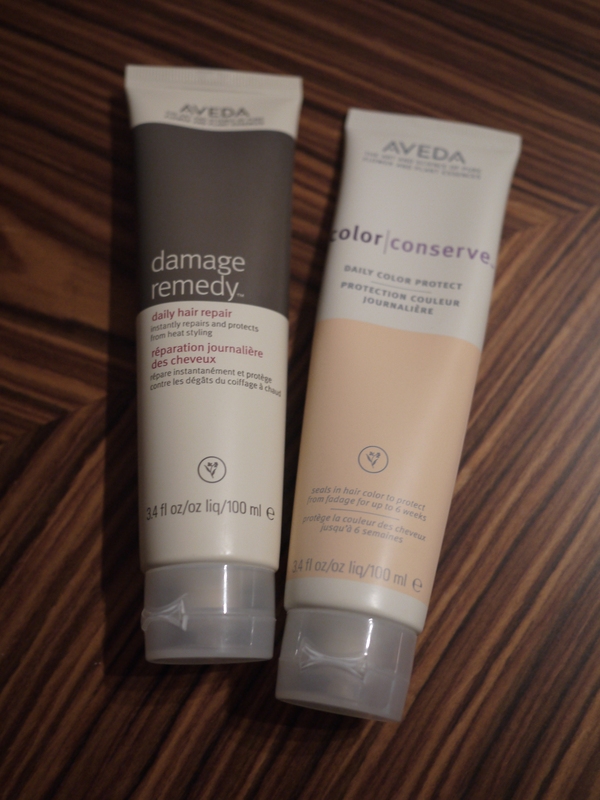 And since the Damage Remedy worked so well for me I decided to go with Aveda as well for my hair color problems. Aveda Color Conserve Daily Color Protect (right) has a more gel like consistency unlike the other one, it is still pretty easy to apply and brush in, and also doesn’t leave your hair feeling oily. It helps relieve your hair from the stress and dryness of hair dying, but this one is definitely not as hydrating as the Damage Remedy. I haven’t really notice any significant increase on how long my color lasts, but I think it’s mainly because I’m too lazy to deal with all the other stuff you’re supposed to do (on top of just putting leave in conditioner in your hair) when taking care of colored hair. I’m already on my 4th Damage Remedy tube and 2nd Color Conserve tube and I’ve never stuck with the same leave-in hair product for more than 1 container worth, so this shows you how much I love these. If you’re in search of a good leave in hair condition, make sure to give these a try!